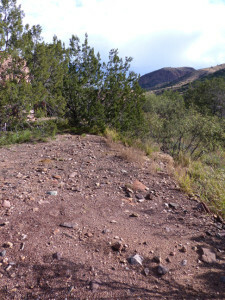 Hike almost anywhere below 6,000 feet elevation in Southern New Mexico where the ground has a few feet of soil cover, and especially where some grass is present, and you will probably come across circular, barren areas, some up to 30 feet in diameter, that are typically devoid of all or almost all vegetative growth. Upon closer examination, one soon notices that these barren areas all contain a central low mound of clean, well sorted, coarse sand to granular pieces of quartz and rock. Pondering these strange features in the early morning, a cool, cloudy day late in the Fall or early Spring or during the hottest part of a Summer day, it may not be immediately evident what produced them. But stand there long enough and the answer will eventually become suddenly and perhaps painfully clear as the first of them begin to make their way up your pant leg and start to bite and sting! Yes, these ARE ant nests! 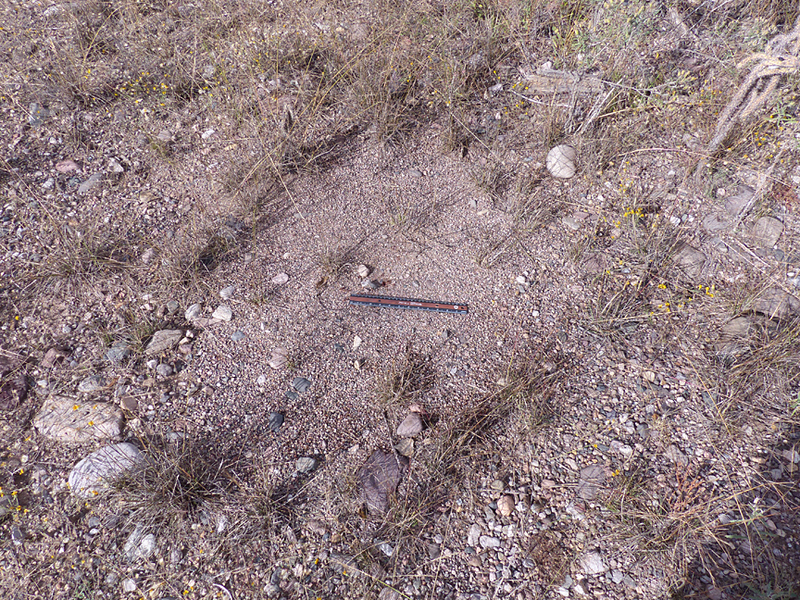 An ant colony to be correct, home of Pogonomyrmex barbatus, New Mexico’s Red Harvester Ants. And what interesting little creatures they are! There are 44 genera and over 200 different species of ants in New Mexico, but perhaps none have been studied as much as the Red Harvester Ant. One of the reasons that they have been studied so much is because they are big, about 8 to 10 mm or 3/8ths of an inch! 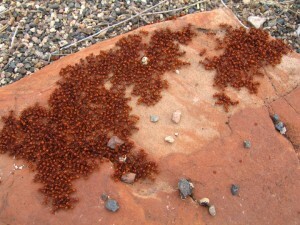 Another is that their colonies make very obvious nests that dot the New Mexico landscape. Larger nests are readily seen on Google Earth’s aerial photos. 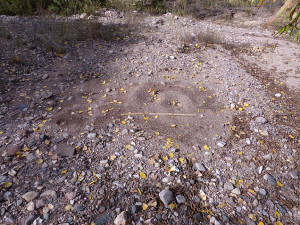 Several years ago this entomologically-challenged, geology-oriented naturalist found this out after laboriously following his GPS through rugged Mule Creek Country terrain to a number of these puzzling circular features discovered on Google Earth while previewing an upcoming hike. It was 18 years ago, when Casitas de Gila Guesthouses were just getting started, that the presence of Red Harvester ants was discovered on the premises. Yes, the hard way, as described in the opening paragraph above! It was soon after that Ants At Work1, a delightful and well-written little book about these fascinating little creatures, came our way. 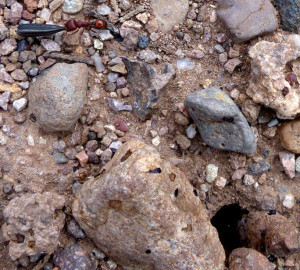 Ants At Work is the result of a 17-year study by Deborah Gordon of 300 colonies of Pogonomyrmex barbatus that were scattered over a 25-acre site in SE Arizona and SW New Mexico. Ms. Gordon began her research in 1985 as a graduate student, continued it as a post-doctoral researcher and later a faculty member at Stanford University. The facts cited below about Red Harvester Ant colonies are mostly from Deborah Gordon’s book, Ants At Work. 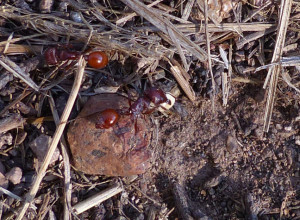 Red Harvester ants live in large underground colonies consisting of a queen and several thousand attending worker ants. 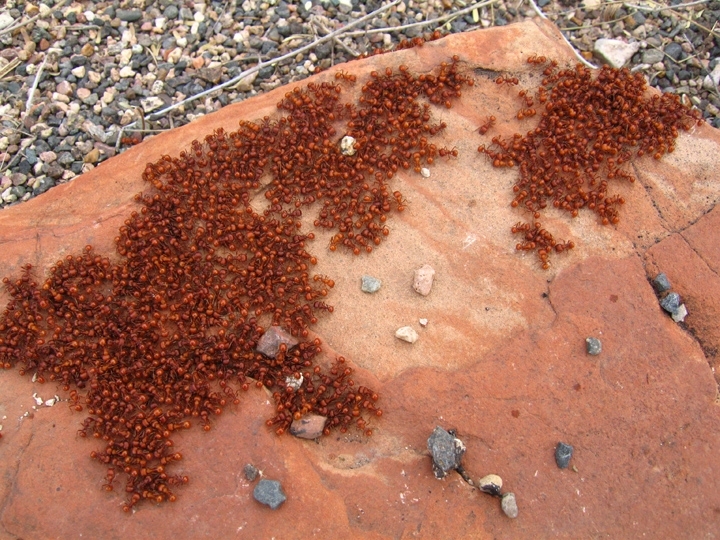 Once reaching mature status, at about five years of age, a colony consists of an essentially stable population of about 10-12,000 ants. Each colony has only a single queen who will produce all the ants born in that colony for her entire life and the life of the colony, which commonly lasts for 15 to 20 or more years. When the queen finally dies, the remaining worker ants, whose lifespan is only a year or less, soon die off also, with the result that the entire colony dies, leaving an empty colony nest that is never occupied again. Colonies begin to propagate new queens and fertile males, called alates, on an annual basis when a colony reaches about five years of age. At that time a new colony is produced when a single, winged “queen” alate from one parent colony is fertilized by a winged male alate from a different parent colony during the annual Summer Monsoon swarming and mating season. 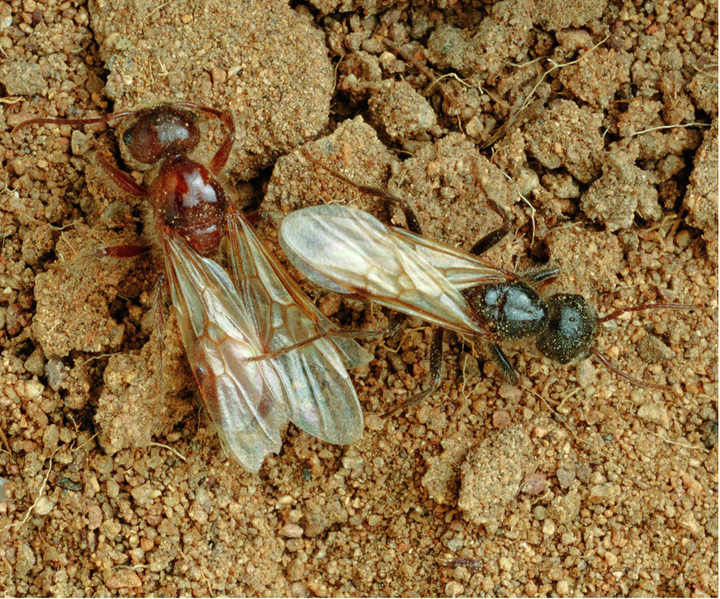 Once mated, the queen flies off to a new location, leaving behind her one-day-stand mating male, who will die within a couple of days, if he is not eaten first by a horned toad, bird, or other insect. Once the mated queen lands, she runs around for a short time before dropping her wings, and now, on the first night after mating, digs a hole some 12 to 18 inches deep, enters the hole and blocks off the entrance, never to emerge above ground for the rest of her lifespan, unless the colony decides to move. Within a few days she lays her first batch of eggs which will hatch within about 6 weeks in the form of tiny, worm-like larvae, which soon turn into pupae, that look like ants enclosed in a papery case. When the ants finally emerge from their pupal case, they do so as full-sized adults that do not grow anymore. Thus, a new colony is born. Colonies of Red Harvester Ants depend on plant material, primarily in the form of seeds as their main food source, which is sought out and brought back from the areas surrounding the colony by outside-the-nest worker ants, where it processed and stored for winter use by inside-the-nest worker ants. About 25% of the colony works outside during the day; the rest stay inside tending to the nest. Colony worker ants can be divided into four groups based on the type of work they do: Patrollers, Foragers, Nest Maintenance Workers, and Midden Workers. Patrollers determine the area to be harvested each day by scouting the area surrounding the nest for food and marking trails by emitting a chemical scent to these food sources which the Foragers will then carry back to the entrance of the nest. Nest Maintenance Workers pick up the food at the entrance to the nest and carry it down into the nest where it is processed and stored, and also bring up sand from the nest below that is added to the ever-growing mound of coarse sand and granules surrounding the entrance to the nest. Midden Workers work on the surface of the mound surrounding the entrance of the nest sorting and moving refuse, debris, and waste material brought up from inside the nest into trash heaps called midden piles which are generally found at the edge of the mound. 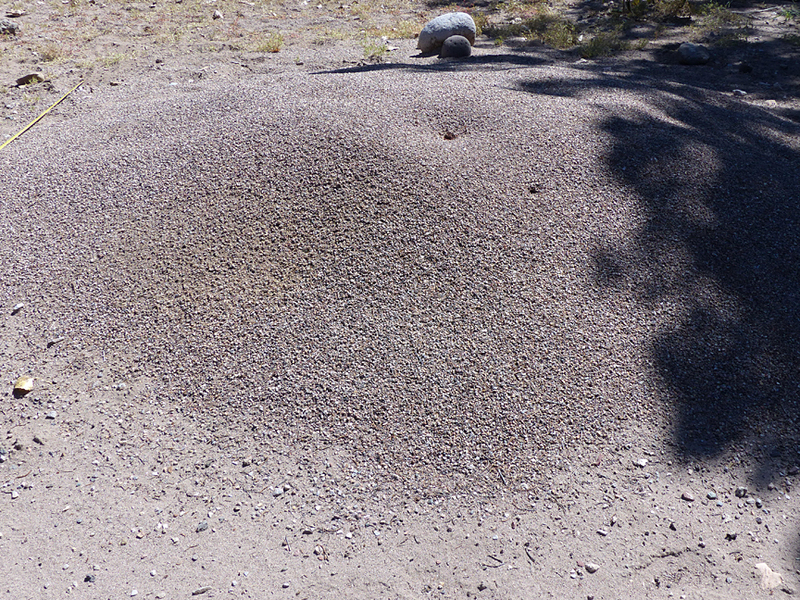 Below the external mound of sand and granules lies a cone-shaped nest that tapers downward consisting of a mass of ¼ to ½ inch chambers with curved ceilings and walls connected by tunnels of varying widths. The chambers in the upper part of the nest that connect directly to the nest entrance hold the 25% of the colony that works outside the nest. The lower chambers are dedicated for various uses, some as living chambers for the Nest Maintenance Workers, some as food storage chambers with neatly stacked seeds, others are brood chambers for the young, the larvae carefully laid out on the floor of the chamber, and the solitary chamber holding the queen. The nest extends downward about as deep as the surface mound is wide, about 10 inches for a 2-year old colony and 5 feet for a 6-year-old colony. 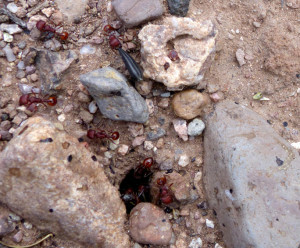 Red Harvester Ant colonies can be found over most of the land around the Casitas. 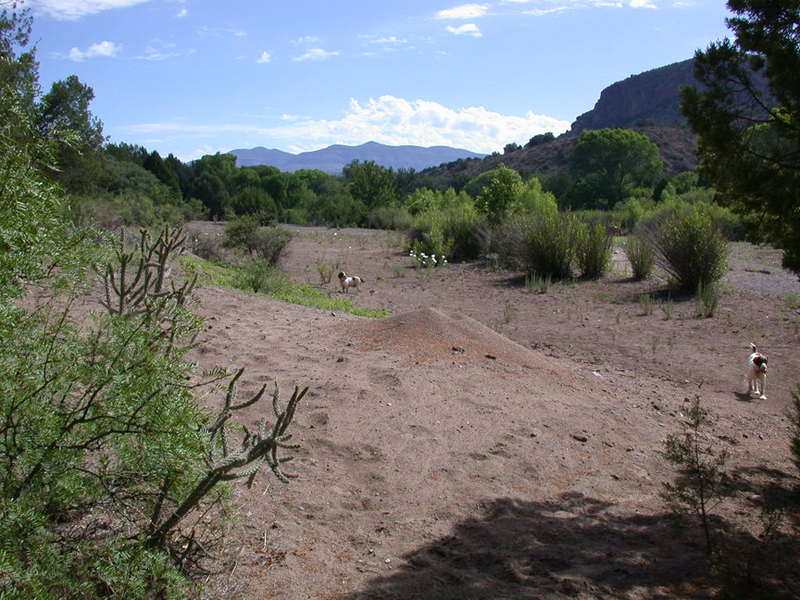 The largest colonies and oldest colonies, however, are found in Bear Creek Canyon, scattered at intervals over and along the first and second terraces above the floodplain, where vegetation tends to be more abundant and dependable from year to year than on the hillsides or on the flats surrounding the Casitas. Below is a photo essay of representative Red Harvester colonies from the largest and oldest to smaller and younger colonies at the Casitas. 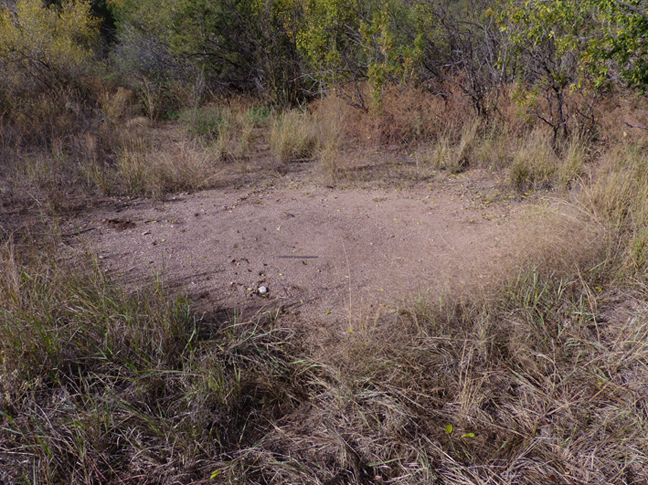 By far the largest and oldest Red Harvester Ant colony at the Casitas is a colony located just below the Casitas on the west side of Bear Creek, with the center of the mound lying about 11 feet above normal creek level, midway up the slope between the first and second creek terraces above the floodplain. The central mound of the nest is cone shaped, measuring 9–10 feet in diameter and about 19 inches in height. 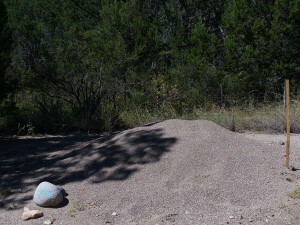 The mound is composed of well-sorted coarse sand to granule size particles of sand and rock averaging .11 inches in diameter, which is typical of colony mounds throughout the Casita property. Surrounding the mound is a ring of bare ground, cleared of all vegetation, the outer edge of which measures 30 feet in diameter. Age of this monumental colony is at least 20 years, and it is still active. The colony was first observed when we bought our land 18 years ago, and although measurements of its size were not made at the time, it was considered the largest colony mound observed on the property. Because of its impressive size, it was designated as Stop L7-3 when the Casitas de Gila Self-Guided Nature Trail was established in July 2001. 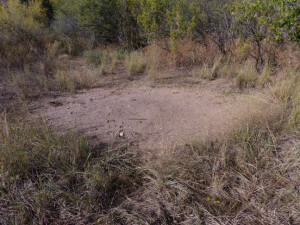 As shown in a photo taken at that time, the size of the mound is estimated to be at least 5 tor 6 feet in diameter which, based on Gordon’s research, would suggest an age of at least 6 years. During the 12-foot flash flood of September 22, 2014, Bear Creek came up to the lower edge of the mound. Downstream, and on the opposite (east) side of the Creek from the Oldest Colony, is the Second Oldest colony known on the property. This colony is interesting because, based on its size, it was established on the floodplain itself about 10 years ago about 7 or 8 feet above the creek, following the Great Flood of February 2005, when Bear Creek switched from the east to the west side of Bear Creek Canyon in front of the Casitas. 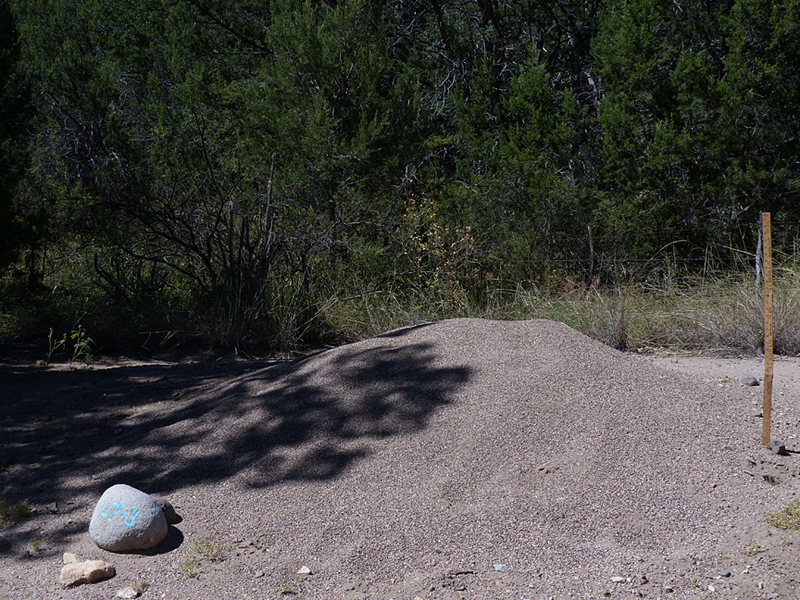 During the 12-foot flash flood of September 22, 2014, this mound was submerged for several hours beneath 4 or 5 feet of rushing water which washed away all of the central mound. 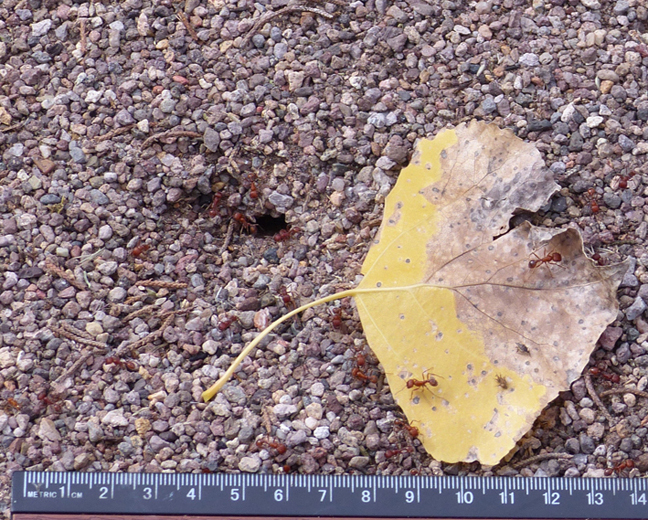 The colony survived, however, as most ants can survive underwater for 24 hours or more, and as the October 2015 photos show, was well on its way to rebuilding the central mound. 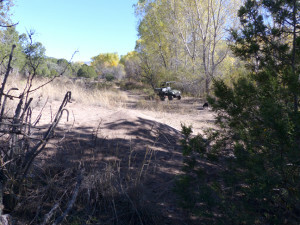 Near the north end of the Willow Walnut Trail, on the west side of Bear Creek, lying about 13 feet above creek level, a typical middle-aged colony is found on a wide, old, creek terrace surrounded by grass and mesquite. 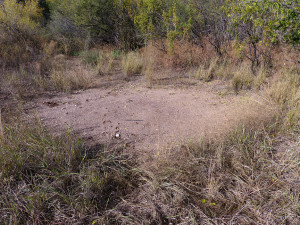 The cleared area around the central low mound is about 14 feet in diameter and the central mound is about 6 feet in diameter and 8 inches high. This colony would be at least 6 years old. A few yards south of the middle-aged colony a young colony is found. 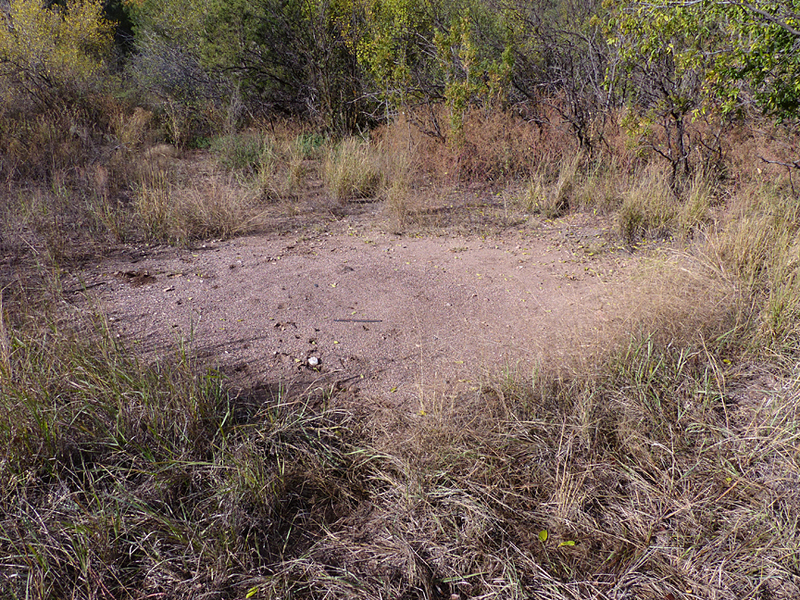 Lacking a peripheral cleared area and an obvious central mound, only the concentrated deposits of the telltale coarse sand and granule sand and rock material surrounding the inconspicuous entrance to the nest identify this as a Red Harvester Ant Nest. Age of this colony is less than 5 years, perhaps 2 or 3 years old. 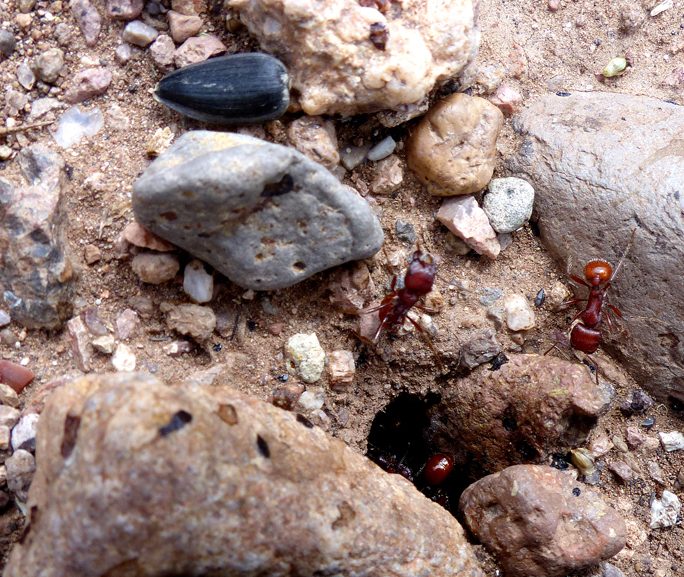 Encountered away from the nest, Red Harvester Ants are not aggressive and will rarely attack or bite the strolling or resting hiker, but will simply carry on with their perceived personal mission, whatever that may be. However, for the preoccupied hiker or obliviously engaged birder who unwittingly pauses within their cleared area, or near the entrance of a not-so-obvious young colony such as this one, for more than about 30 seconds, it will be, shall we say, a most memorable learning experience. Soon, those open pant legs will become the center of attraction for a host of the colony’s Patrollers, Nest Maintenance, and Midden Workers who will do their collective best to remove you from their premises! The actual bite of the Red Harvester ant itself may or not be all that painful, sometimes going unnoticed . . . for awhile . . . but after a few hours will eventually produce a large welt from the venom it has injected in the various parts of one’s lower anatomy. Depending on one’s own chemistry and allergic reaction, these welts can be either itchy or burningly painful . . . or both. But eventually, like maybe in three to five days (as is the case with this humble naturalist), they will suddenly disappear. Taking good hot showers seems to speed the process of recovery and during the interim of healing will act both as a temporary palliative on the welts as well as a provider of rather unusual exotic sensations! 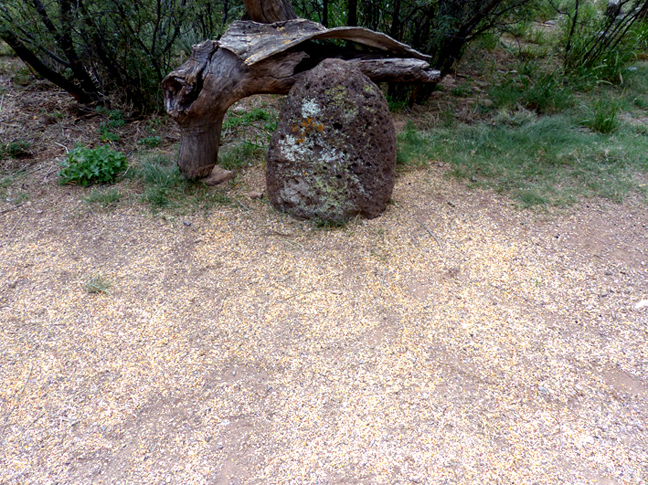 Here at Casitas de Gila we have been feeding the wild birds between 50 to100 pounds of birdseed a month, year-around, for some 18 years now, for the enjoyment of our guests as well as ourselves. Behind the office and our Casa we have established a feeding station where we sit each morning having a cup of tea while discussing our tasks for the day, and watching what we have come to call the Casa Birds just outside the window. For both of us, watching the comings, goings, and annual return of the wide variety of species that change through the seasons here has become a morning ritual of never-ending pleasure. About 70 feet to the west of the Casa Bird Feeding Station is the Studio, where occasionally we find time to engage in some creativity. One morning this summer, while looking across the canyon to see if the Bighorn Sheep were on the cliffs, a progression of Red Harvester Ants was observed marching along double file in what appeared to be a well-established trail in front of the Studio door, with some ants heading south away from the Studio, and others heading north towards the Casa. Many of the ants heading south appeared to be carrying something in their mandibles, while all of the ants heading north carried nothing. Ah-hah! A Red Harvester Foraging Trail! Where does it go? Following the trail to the south about 40 feet, the nest was soon encountered. It was obviously the nest of a young colony as indicated by the lack of a distinct mound and only the familiar heavy scatter of coarse sand and granule-sized particles of rock to mark the entrance to the nest. After spending some time photographing the colony’s nest, as well as some of the Foragers that were returning with pieces or whole seeds of some sort, it seemed appropriate to follow the foraging trail northward to possibly discover the source of the food the ants were carrying. Following the trail past the Studio there were places where the ants had literally worn a path 1 to 2 inches wide through the rocks, weeds, dead juniper twigs and grass covering the ground. Eventually the trail ended . . . surprise, surprise . . . at the Casa Bird Feeding Station, or perhaps now more appropriately named, the Casa Bird and Ant Feeding Station. How long this had been going on is not known, but the age of the colony nest is probably only one or two years. Watching the ants select their next forage seed at the feeding station was interesting. Their criteria for selection was not obvious by any means. Occasionally two ants would spy the same seed at the same time and they would battle over it and around it for a minute or two, like lilliputian wrestlers, before staggering away, both of them leaving the seed behind. Millet seeds and small pieces of cracked corn seemed to be preferred. 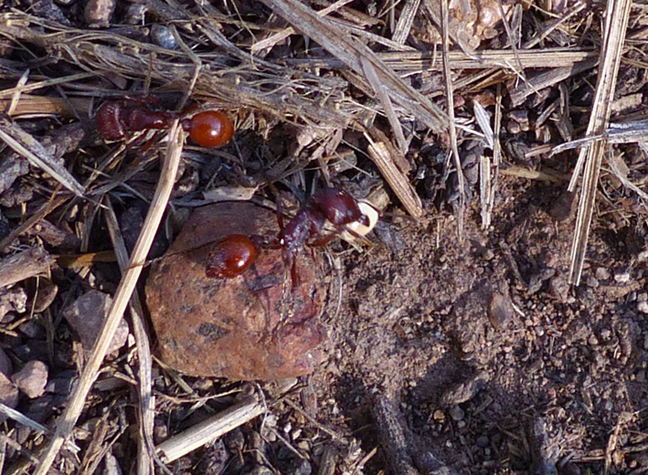 After watching this foraging frenzy of the Red Harvester Ants at the Casa Bird Feeding Station for a while, the Humble Naturalist decided to trace the foraging trail back to the Studio. 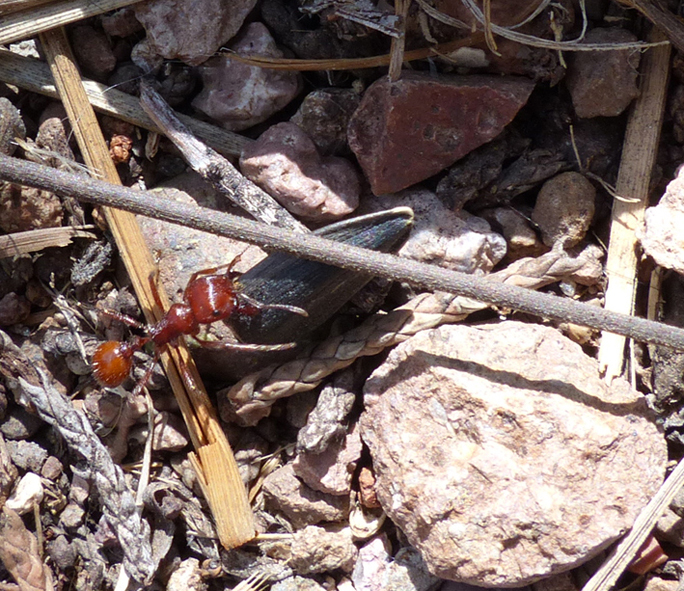 About half way back, a lone Forager Ant was spotted carrying a very different, and seemingly much heavier, load than the other Foragers. It was carrying a whole Sunflower seed. 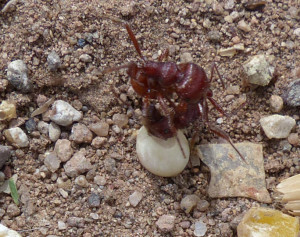 Now the adult Red Harvester Foraging Ant averages about 9 mm (1/3 inch), but the seed that this ant was carrying was longer than it was, measuring 10.4 mm (4/10 inch) long. The measured weight of an average Sunflower seed in the wild bird seed is 0.3g (0.01oz), whereas the average weight of a Red Harvester worker ant is 5.5 mg (.0002oz)2. 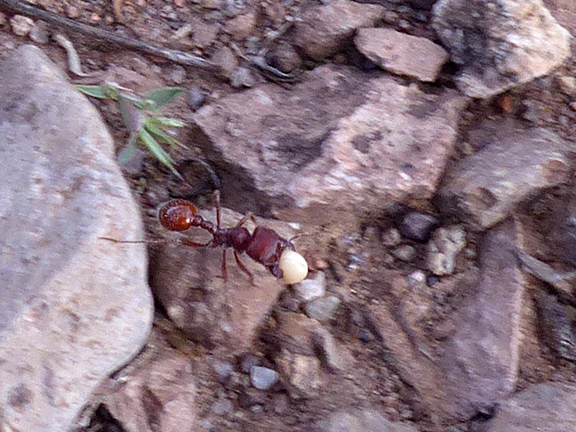 Thus, this lone Forager Ant was transporting a seed roughly 50x its own weight. In comparison with humans, this would be the equivalent of a 160 lb human transporting 8,000 lbs or 4 tons of sunflower seeds. Now the distance from the Casa Bird Feeding Station to the entrance of the Studio Colony Nest is 110 feet. Since a 6-foot human is 1800 mm and the length of an average Red Harvester Ant is 9 mm, the human is roughly 200x longer than the ant. Thus, to equal the 110 feet traveled by the ant, the human would have to transport that 4 tons of sunflower seed some 22,000 feet or 4.2 miles. 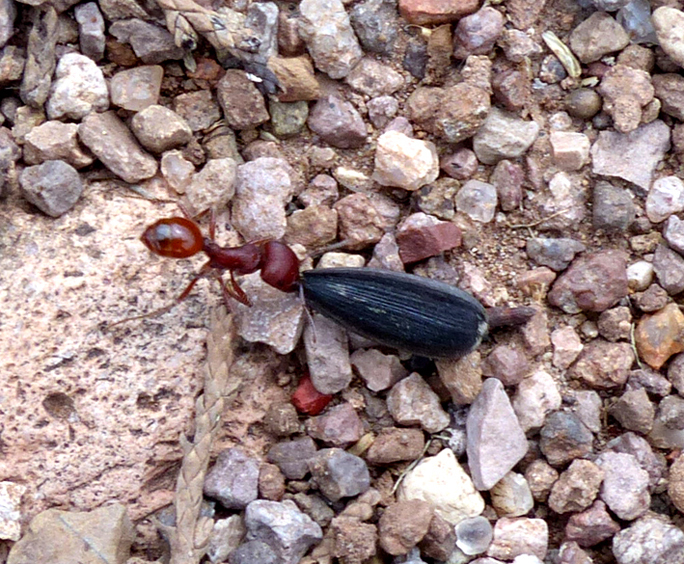 At first the Humble Naturalist thought that the Forager Ant was actually carrying the Sunflower seed along the trail. However, a lengthy series of close-up photos documenting its journey back to the Studio Colony Nest showed that for the most part not only was it pushing the seed along the ground, but it was using appropriate physical engineering principles in doing so. Sunflower seeds have a distinctive shape, namely that of a flattened tear drop, with a slightly bulbous, rounded blunt end and a sharper, more pointy, thinner end, with a pronounced raised rim around the flattened edges of the seed. 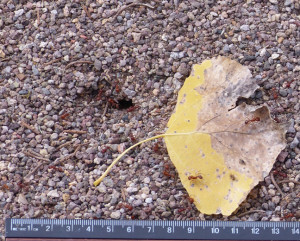 As the photos show, the Forager Ant for most of the journey did not carry the seed but rather pushed it along the ground by first grasping the narrow axis of the blunt end with its mandibles to stand the seed vertically on the rim surrounding its edge, and then, with the upturned pointy end facing forward much like single runner on a skate, shoving the seed down the trail. 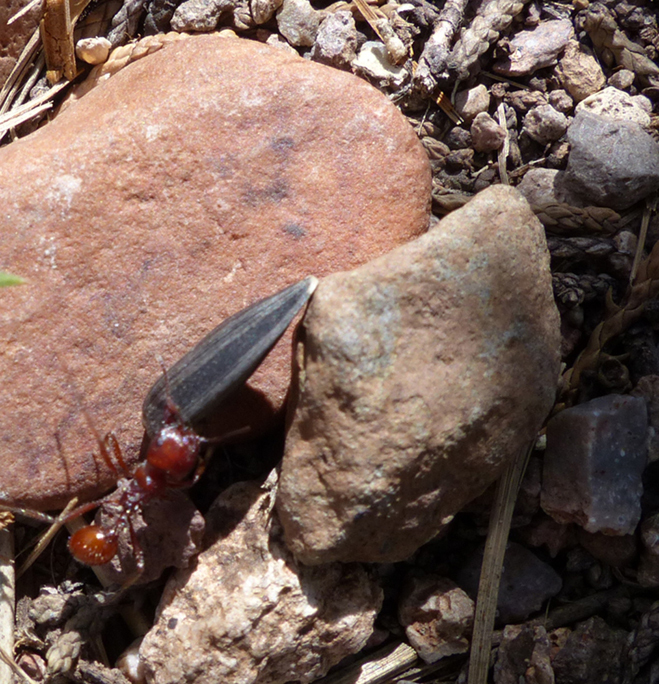 By pushing the seed in this manner, and tilting it from side to side, Forager Ant was able to steer the seed over, around, and through the never-ending obstacles of pebbles, twigs, and vegetative material along the trail. Occasionally, when encountering a big pebble or twig, it would switch to the other end of the seed, and grasping the pointy end, drag it over the obstacle, and then resume pushing from the rear. 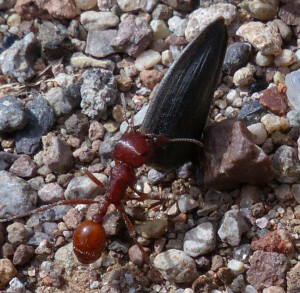 After analyzing numerous photos of Forager Ant’s homeward journey, it was obvious that this Forager Ant had been an honors student in Physics 101 at the Red Harvester Ant Foraging School. When the going gets tough, a tough Forager keeps going . . . 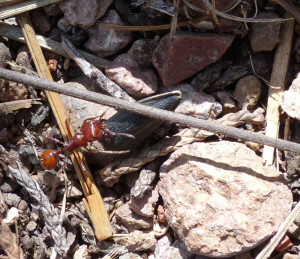 Despite all obstacles, Forager Ant just keeps pushing . . . 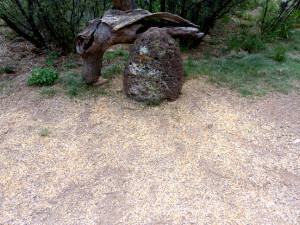 Repeated measurement of Forger Ants carrying a single piece of millet or corn from the Casa Bird Feeding Station to the entrance to the Studio Colony Nest gave consistent speeds of roughly 10 feet per minute, or 0.11miles/hour, completing their journey in about 11 minutes. The speed of the Forager pushing the Sunflower seed was not measured at the time, nor was the act of a Forager Ant bringing home a whole Sunflower seed ever seen repeated, but obviously Forager Ant had been moving much slower, perhaps 1/3 or 1/4 the speed of the millet-carrying Foragers, thus taking between 30 to 45 minutes from Bird Feeding Station to Studio Colony entrance. Dejected beyond belief that its beyond-the-call-of-duty, extreme foraging effort is not appreciated, Forager Ant drags the sunflower seed a short distance away, stops, pauses for a few seconds, and then turns and makes a second attempt at taking it to the nest entrance. Again, and in no uncertain terms, Forager Ant is stopped by the ever-alert Nest Maintenance Ant and told once more to take the seed away. With dejection now having turned to hardly concealed anger, Forager Ant starts to haul the Sunflower seed away, but instead, overcome with rage, throws it against a big pebble, and stalks away in a totally uncharacteristic and unheard of state of rebellious, non-collective Red Harvester Ant Colony Consciousness, emitting faint ant obscenities and obnoxious pheromones as it disappears into the weeds. The abandoned Sunflower seed was patiently observed by the Humble Naturalist for quite some time to see what would happen next, and although a few ants came and smelled it, they made no attempt to move it. Returning to the nest an hour or so later, it was discovered that the Sunflower seed had been removed from the rock were Forager Ant had thrown it. What happened to the Sunflower seed is unknown. Most likely is that the Nest Maintenance Worker Ant instructed a Midden Worker Ant to take it to the Midden Pile off to the side of the Mound, but, despite a short search, it couldn’t be found. As to Forager Ant? 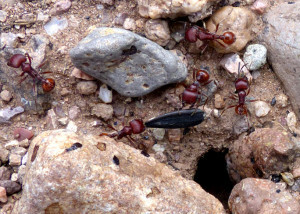 Also impossible to say, but it is highly likely that soon after the disruptive event, a parable about a radical, Overachieving Forager Ant who brought back food too big to fit through the entrance of the nest would become part of the colony’s teaching curriculum for schooling young ants after they emerged from their pupae in the brood chambers for many years to come. Deborah Gordon, 1999, Ants at Work, The Free Press, Simon and Schuster, 182 pp. 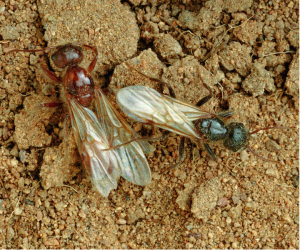 Robert A. Johnson, 2002, Semi-claustral colony founding in the Seed-harvester ant Pogonomyrmex californicus: a comparative analysis of colony founding strategies, Oecologia, 132:60-67. Springer-Verlag. 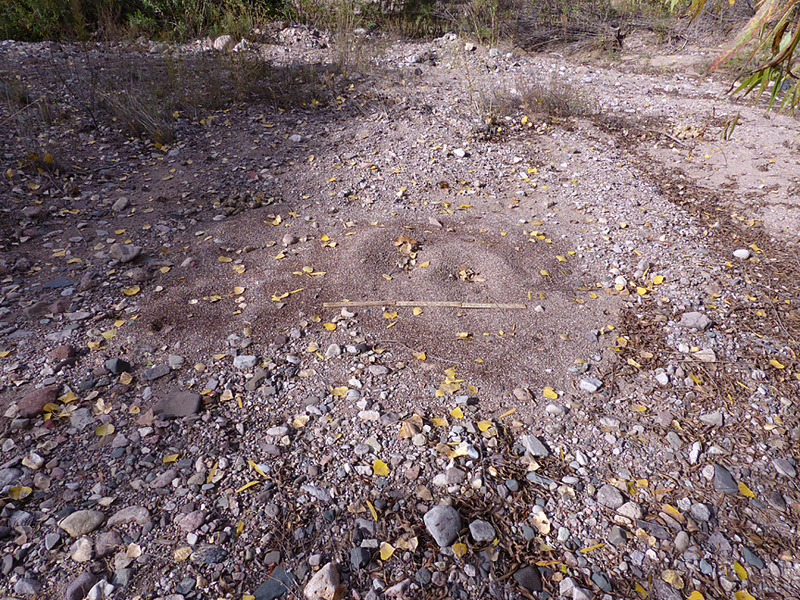 This entry was posted in ants and tagged ants, Bear Creek, nature. Bookmark the permalink.